I first tried this dish not in Taiwan but in Malaysia, in one of their night markets in SS2 Petaling Jaya, Selangor. Night Markets or Pasar Malam happens only once a week it’s a place where hawkers sell different things from fresh veggies, fake watches to household items. It is one of the places I always visit because it is also a paradise for foodies, especially for those who love street food as you will be presented with hundreds of choices in very affordable prices. One of the choices is this post and I discovered it when I saw people queuing up for this freshly deep fried chicken cutlet served on a brown paper bag, I got curious and bought one myself. The first time I tried it I can’t believe that this was made out of chicken breasts as they are very tender and tasty. Taiwanese Breaded Chicken or Ji-pai is a type of Fried Chicken Fillet where it is crispy on the outside and tender juicy on the inside. It is one of the most popular snacks in Taiwan and like in Malaysia it is sold on night markets. This chicken dish is similar to fried chicken but it is only made out chicken breast which is pounded flat, marinated in spices, battered and then quickly deep-fried. Some other variations exist like the addition of cheese and fruits, some also sprinkle additional flavouring once it’s cooked cheese, sour cream and chives and barbecue. For this version we will stick with my version of the traditional one, the simple deep fried chicken cutlet that made this popular. Cut chicken breast into two then thinly slice each side into 2 pieces yielding 4 pieces for each breast. Using a meat pounder, lightly pound each piece until they are flat. Place in a container that can be covered then set aside. Mix all seasoning ingredients in a bowl then pour it into the chicken breasts. Lightly massage each chicken piece to evenly distribute the seasoning then cover the container. Place it in the refrigerator and let it marinate for at least 6 hours. Mix together flour and corn starch, place in a flat container. Place eggs in another container. Place bread crumbs in another flat container. Remove chicken from the refrigerator then lightly dip it into the flour mixture, then dip it on the beaten eggs then into the bread crumbs. Set aside and do it with the remaining chicken breast. Prepare a deep fryer or a wok with enough oil for deep frying, heat oil until hot but not smoking (ideally 180C) then deep fry each chicken piece until golden brown, this will take around 5 minutes. Once cooked place in a dripping container to remove excess oil then serve. Taiwanese breaded chicken is one of the nice snack! Ooo, I miss Malaysia and its street food. I want to try this too 🙂 can i grab the recipe? Who doesn’t like fried chicken?! Though I don’t eat it often, the crispy texture of these would certainly lure me to indulge. I’m craving these now!!! Yummy!! 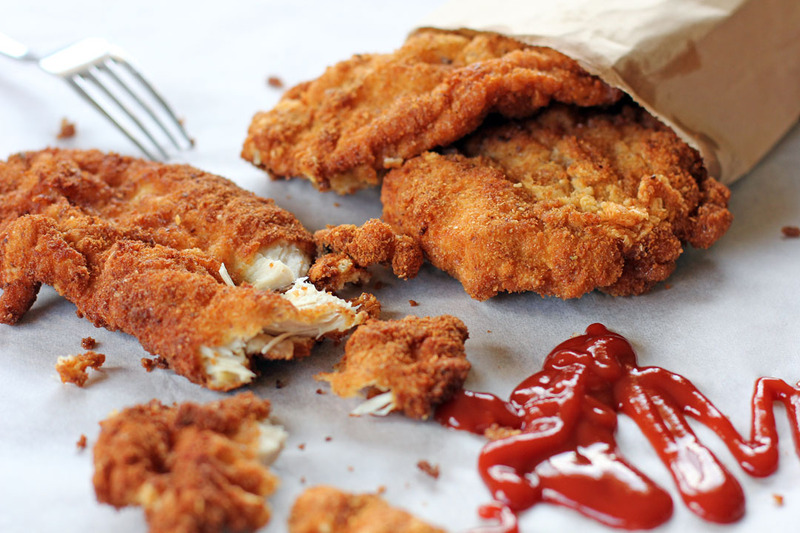 What a great way to make chicken fingers! Looks good! Oh yum! I could eat little fried chicken pieces like this all day! Boy I wish I had some of this now. Looks perfectly crisp and golden. Geee…. I used to frequent that night market as a student. I miss it so much.